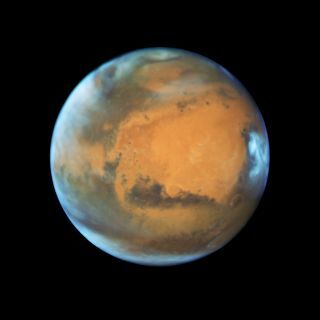 The Hubble Space Telescope caught this view of Mars on May 12, 2016, a few days before the sun and Mars were on exact opposite sides of Earth. Beginning in early June and continuing into July and August, those who look skyward toward the east-southeast during the evening hours will almost certainly notice a brilliant orange-red "star" shining with a steady light. Many will no doubt wonder what this object is. "Certainly," many will think, "nothing so bright and colorful was evident here before. Where did it come from?" In fact, this isn't a star, but a planet: Mars. This year, until now, the Red Planet has been visible only to early risers, and while bright, it was not exceptionally so. But with each passing night, Mars has been rising a little earlier and getting a little closer to Earth. On that day, the Red Planet will blaze at magnitude -2.8 — twice as bright as Jupiter, but dimmer than Venus. (Lower magnitudes are brighter.) When you look through a telescope with an eyepiece magnifying 75 power, Mars' disk will appear as large as the disk of the moon to the unaided eye. However, Mars will be far south when it is at its best; it will be in the zodiacal constellation of Capricornus, the sea goat, with a declination of -25.8 degrees. As such, observers at northern latitudes will never see the planet very high in the sky, so atmospheric turbulence will impair the view more than usual. In fact, for observers in most of the United States, Mars will be so low in the sky as to hamper telescopic work. When the planet crosses the meridian and attains its highest point in the sky, at around 1 a.m. local daylight time, Mars' altitude above the southern horizon will be only 23 degrees as viewed from Chicago and 30 degrees from Los Angeles. Remember that your clenched fist held at arm's length measures roughly 10 degrees in width. So, for skywatchers in most of the United States, Mars will appear no higher than two or three "fists" above the horizon. The Martian telescopic disk will appear at least 14 arc seconds in diameter for nearly five months, from May 24 to Oct. 13 — larger than it has been for such an extended interval for over a decade. On Mars, this period closely corresponds to the arrival of fall (May 22) and winter (Oct. 16) in the planet's northern hemisphere, and to spring and summer in its southern hemisphere. Mars has seasons like those of Earth, but they average almost twice as long. Because the Martian south pole is tilted toward Earth from now through the rest of 2018, the south polar cap will be excellently presented to us. In June, the typical winter cloak of clouds over the polar region should dissipate, leaving the south cap shining brilliantly and undergoing spectacular changes during its rapid springtime thaw. So, as May winds down, the cap will be near its maximum extent, and its subsequent seasonal shrinkage will be most compelling to follow. Many interesting and sometimes surprising seasonal changes happen on Mars during this period. Around the time when Mars is closest, even a 3-inch (8 centimeters) telescope can show dusky markings on its small, red disk, as well as the bright white of the polar cap. However, a telescope with an aperture of at least 6 inches is usually recommended for visual observations of this planet; magnifications of 150 to 200 power should provide the best views. If you have a 10- to 12-inch (25 to 30 cm) telescope, 250 to 300 power is recommended. You can then follow the planet's dark markings, south polar cap, clouds and hazes. Some astronomers used to think the Red Planet's dark surface markings were vegetation, but space probes in the 1960s and '70s revealed the markings to be vast expanses of rock and dust. Windstorms sometimes move the dust, resulting in both seasonal and long-term changes. Those who carry out systematic observations can contribute some useful knowledge about Martian weather and surface conditions. If you're interested, you might want to contact ALPO — the Association of Lunar and Planetary Observers — which has an observation section specifically dedicated to Mars. If you're a beginner, even a large telescope will show little when you take your first look at Mars. But if you inspect the planet night after night, your eye will gradually become accustomed to the low contrasts and soft boundaries of the blotches appearing on its disk. You will soon grow familiar with Martian rotation, which causes markings to move over the disk from right to left as seen in an astronomical telescope with an inverted field by an observer facing south. As a result, a particular feature comes to the middle of Mars' disk about 40 minutes later than it came the night before. Regardless of how you intend to watch Mars in the coming weeks — either with a telescope, or with just your eyes — it will prove to be a striking object, attracting the attention of even the most casual of skywatchers. Truly, this is going to be the summer of Mars!